We're turning tonight to Acts chapter 4. Just to fill you in if you haven't been here on previous nights, or have missed one or two - we're looking, as I said, at the book of Acts, under the heading “When God ACTS!”, what happens when God does His work His way. On Sunday evening we had a sort of introduction, and we looked at how, when God does His work, 'The Gift Of The Holy Spirit Is Released'. Then on Monday evening we looked at how there will be 'Boldness in Witness'; and last night we looked at how, when God is at work, 'The Miraculous Is Displayed'. Tonight we're going to look at how, when God does His work His way, there is 'Unity in the Body'. Tomorrow evening, God willing, we will look at how there is 'Missionary Expansion', the Gospel is taken to farther fields when God is doing His work. Tonight we're looking at how there is 'Unity in the Body', and we're looking at chapter 4 - where we have been, I think, for the last two nights here and there - and we are taking up the reading just where we left off. You remember this marvellous prayer by the apostles, we saw it last night, that God would stretch out His hand to heal - verse 30 - and that signs and wonders would be done 'through the name of Your Holy Servant, Jesus'. What a wonderful thing that was, and to see in verse 31 the actual house shaken as they were all filled with the Holy Spirit. But we're looking at verse 32 now to the end of the chapter: "Now the multitude of those who believed were of one heart and one soul; neither did anyone say that any of the things he possessed was his own", no one claimed exclusive possession of what he owned, "but they had all things in common", they shared everything. "And with great power the apostles gave witness to the resurrection of the Lord Jesus. And great grace was upon them all. Nor was there anyone among them who lacked; for all who were possessors of lands or houses sold them, and brought the proceeds of the things that were sold, and laid them at the apostles' feet; and they distributed to each as anyone had need. And Joses", or Joseph, "who was also named Barnabas by the apostles (which is translated Son of Encouragement), a Levite of the country of Cyprus, having land, sold it, and brought the money and laid it at the apostles' feet". Let's come to the Lord again, and as I have asked you each night before I preach: I want you to pray now specifically for yourself, that God will speak to you tonight. We do want the presence of God to come among us, we want to all be blessed, and I need help as the preacher - but I want you to particularly come to the Lord for yourself, would you do that? Ask the Lord to speak to you tonight. Please pray that, I believe that's a prayer God answers if you pray it sincerely from your heart. So let's come: Holy, Heavenly Abba Father, we bless Your name, we bless You that You are the Thrice Holy God - Holy, Holy, Holy. In the name of the Father, and the Son, and the Holy Spirit we come to You now. We want to exalt You and praise You as the High and Lofty One who inhabits eternity. We thank You that You have come to us in the Person of the Lord Jesus Christ. We bless You that Jesus has come in our own flesh, apart from sin, to be our Redeemer. He has suffered and died for us, He has shed His blood. We thank You that He has cleansed us from our sins, we thank You that He has conquered Satan, death, and hell itself. We thank You that we are more than conquerors through Him tonight, and we want to invoke by faith the mighty name and claim of the Lord Jesus Christ - His death and His resurrection. We take authority tonight over anything that is contrary to His will and His Kingdom reign, and we bind any force of darkness in this place tonight. We declare to the heavenly realms that they have no authority here, and in the name of Jesus we overcome. We pray, Father tonight, that there will be a mighty release of the Holy Spirit's power, that You will come suddenly into Your Temple, into our lives, and that You will take a dealing with each of us. Lord, we need You, our families need you, this church needs you, the church in Magherafelt needs you, the church in Ulster, and in Ireland, and the United Kingdom - Lord, we need a fresh breath of Your Spirit. O, that You would breathe upon us tonight, Living God! Lord, bring prophetic word this evening, and may we have that New Testament Acts experience that we are cut to the heart, that we will not fight with You tonight but that we will surrender to what we are hearing You say - even if it is against the grain and uncomfortable to us. So Lord, come, we pray. We only want to hear Your voice, that's all we're interested in, Your mind and Your heart. So come Lord Jesus, come Holy Spirit. Amen. You see clearly from these verses we read from chapter 4 'Unity in the Body'. We see it right throughout the Acts of the Apostles, and of course it's taught throughout the rest of the New Testament. There is one word that really sums up the concept of unity, it is a symptom of love. Love, Jesus very clearly said, was to be the mark of a true disciple. A follower of Christ was to be known by their love. He said that explicitly in John 13:35: 'By this all will know that you are My disciples, if you have love for one another'. You remember that Jewish lawyer, that student of the Torah, the Laws of God, who came to the Lord Jesus on one occasion and tested Him, asking Him: 'Which is the greatest commandment in the Law?'. The Lord Jesus responded, saying to him: ''You shall love the LORD your God with all your heart, with all your soul, and with all your mind'. This is the first and great commandment. And the second is like it: 'You shall love your neighbour as yourself'. On these two commandments hang all the Law and the Prophets'. What the Lord Jesus was doing there was, He was establishing love as the highest of all spiritual virtues. He said that it sums up the whole of the Law and the Prophets. To put it in contemporary language, and to paraphrase that, Jesus was basically saying: 'Love is what the Bible is all about' - that's what the Law and the Prophets are, the Bible. So if you were to sum up the whole theme of this book that you cherish, I hope tonight, it is 'love'. We as God's people, and disciples of Christ, are to be known primarily for this virtue and attribute: that we love one another, and that we lavish love on others who are unlovely and unlovable. That's the way the early church was, even secular history accounts for this. Describing the first century Christians to the Roman Emperor Hadrian, Aristides said - I quote him: 'They love one another. They never fail to help widows. They save orphans from those who will hurt them. If they have something, they give it freely to the man who has nothing. If they see a stranger they take him home, and are happy as though he were a real brother. They don't consider themselves brothers or sisters in the usual sense, but brothers instead through the Spirit in God'. Now it's very clear from a casual reading of the New Testament that love is an essential - but I fear that as Christians, particularly in our modern era, and - I have to say it again, as folk who value the holy Scriptures, we might call ourselves 'conservative evangelicals' - we have often dispensed of love in favour of truth. That might shock some of you, me saying that - but that's often a choice that is made. We feel that we have to choose truth, and we can be very angry and even aggressive in our expression of truth, at the expense of love - when, in fact, love is truth. It is not one or the other, and indeed we've got to get away - I believe - as Christians from understanding truth as doctrinal and theoretical, and really come to terms with the fact that Jesus said: 'I am the truth'. The truth is not a theory or a dogma, the truth is not a creed or a confession, the truth is a Person! If you want to know the truth, you've got to get to know the Lord Jesus Christ. That's the only thing, really, I'm interested in - not what somebody believes, in the sense of ticking a box of various statements of faith, but I want to have fellowship with people who know the truth, that is Jesus Christ, the Son of God, as their Saviour and Lord. Love is truth, and the only truth is Jesus Christ - and He is love. So you cannot separate love and truth. Gayle D. Erwin wrote a book called 'The Jesus Style', and in it he says: 'I was shocked to find that such a statement', that is 'Love one another', 'was missing from the great doctrinal statements of denominations, missing from the great systematic theologies, missing from the creedal statements and, most unfortunate, missing from our daily lives'. Isn't that interesting? You think about it: love is missing from a lot of our great doctrinal works, that says something in itself. Yet it is tragic, because it gives the impression that it's all right to have truth, per se, and it's even possible to have truth, devoid from love. It minimises the importance of love, it puts it down there - in fact, it even eradicates it from existence, doesn't even tangibly admit its necessity - and yet the Lord Jesus Christ put it at the very top of all spiritual qualifications. Paul the apostle, inspired by the Holy Spirit, in that great purple passage, 1 Corinthians 13, said: you can have all that you like, you can speak with the tongues of men and angels, you can understand great mysteries, you can prophesy, you can even give your body to be burned and be a martyr - but if you don't have love, you are nothing! A flat zero in the spiritual realm! Strong stuff, isn't it? This is how important love is! Your own John Calvin said: 'Whatever is devoid of love is of no account in the sight of God'. It's nothing! You can have all the truth you like, but if you don't have love it's nothing, God says! Wow. You can have all the truth you like, but if you don't have love it's nothing, God says! We see this love for one another manifest in the early church in their unity in verse 32: 'they were of one heart and one soul' - unity of purpose. 'One heart and one mind', some translations say. They were united in their heart, unity of purpose - is that the way this church is? Is that the way the church at large is in our nation? But it was more than that, it was very practical - there was unity of possessions: 'neither did anyone say that any of the things he possessed was his own, but they had all things in common'. Just the way one body would be, your possessions are your possessions, they don't belong to anybody else - and in the Body of Christ everyone shared what they had, so that none lacked. So unity was the fruit of their love for one another. Tertullian, the church father, said of the early Christians: 'How those Christians love one another!'. Let me ask you tonight: what do you think the world sees now in the church of Jesus Christ? What would they say of the church today? I mean, be honest with me: what would they say? Would they say: 'How these Christians love one another!'? You'd only need to be watching the news for the last three weeks to work out what people are saying. Is it too strong to consider that they would say: 'How these Christians hate one another'? Is that too strong? I don't think so! Remember last night I was talking to you from chapter 4 about the man at the Beautiful Gate, the crippled man whom Peter and John found, and they had no money to give him - he was begging - but they had the power of Jesus of Nazareth, and he went walking, and leaping, and praising God, healed. But do you remember what they said to him in verse 4 of chapter 3, they said to him: 'Look at us!'. Now that's not incidental, that is highly consequential. They were able to say: 'Look at us! And if you look at us you will see the very life and love of Jesus Christ'. Now, if we were to say to people in the world - and let's not go too far universally, let's think of Magherafelt, and I don't know it, I only know Portadown and I know a right bit about it. 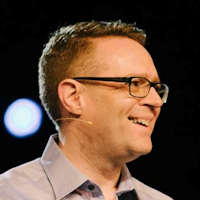 I live in Portadown and I was born and bred in East Belfast, so I have my own baggage, and I know all about the way the church can be seen in a community. But if we were to say, 'Look at us! Look at us! ', what do the people see? Eh? I'm almost sure they will see fighting, somewhere they will see fighting - just tell me if I'm wrong. I'm absolutely sure they will see bigotry, because the church is filled with it. They will see sectarianism, and they will see a party spirit - am I wrong? 'Look at us! Look at us! We've got the truth, we've got the Gospel! We know Jesus!' - and they look at us, and they think, 'Aye!'. If I was to ask you the question: how many Christian denominations are there in the world? What would you say? Right Jonathan, go on have a stab - how many Christian denominations in the world? It's not a Bible question, so you're allowed to get it wrong! Have a guess - you can't remember? Anybody stab a guess? Christian denominations in the world? 2000, any advance on 2000? It's like a market, isn't it! Any advance on 2000, 2000, 2000? 2000, that's a lot, isn't it? Any advance on 2000 - 7000? Gordon Conwell Seminary in the United States in 2010 did a survey, a research survey, and they found - wait for this - that there are 41,000 denominations taking the name of Christ in the world. Now you can have your freedom of conscience all you like, and you deserve it, and it's your right before God - but you can't convince me that that's what the Lord had in view when He said: 'That they may be one as We are one, Father' in John 17. I'll take a lot of convincing that this is what Jesus meant. Then the theologians will say, 'Oh, but hold on a wee minute, that is the mystical union of the body of Christ in the invisible realm, all together, the spiritual union' - is it really? Turn with me to John 17, what does the Bible really say? Verse 22: 'The glory which You gave Me I have given them, that they may be one just as We are one: I in them, and You in Me; that they may be made perfect in one, and that the world may know that You have sent Me, and have loved them as You have loved Me'. Jesus was praying that there would be unity in the Body among Christians, so that the world might know that God sent Jesus - now, how are they going to see that if it's invisible? How are they going to know about it if we are fighting with one another, and that's all they know of Christianity? Come on! If I was to ask you the question: how many Christian denominations are there in the world? What would you say? It's convenient for us to hide behind our bickering, and our backbiting, and our partisan spirit - but it's an absolute travesty to the name of Christ, and it is an indictment against Christendom at large that this is the very thing that was to mark us, and this is the very thing that was to show the world that we belong to God, and it's the very thing they don't see - but the opposite. First John 4, listen: 'If someone says, 'I love God', and hates his brother, he is a liar; for he who does not love his brother whom he has seen, how can he love God whom he has not seen? And this commandment we have from Him: that he who loves God must love his brother also'. Some people say, 'Ach, I do God, but I just don't do people' - I can sympathise a wee bit with you, the more I get to know my brother the more I love my dog at times! Isn't that the way we feel? But, you see, we are called to love one another - the unlovable, when we are unlovely. Our vertical relationship with God, like the cross of Jesus Christ, if we're right with God vertically, we will be right with our brother horizontally - it just follows. In Genesis, you remember chapter 3, God's relationship with man broke down through Adam's sin, and then it wasn't very long after that man's relationship with his brother, Cain and Abel, broke down. If our relationship with God is restored and redeemed, our relationship with one another should be affected, if it's worth anything at all. But what is it really like in the church? A respected Bible teacher said: 'If there is anything that would keep me away from Christ, if I was lost, it would be the attitude of Christians toward one another' - the dividedness in the Body of Christ, the sectarianism. What did Jesus say about this? Turn with me to Mark chapter 9, what did Jesus say? Surely that would be important? The Head of the church, the One who bled and died for the church, and rose again to give the Body resurrection life - what He says must be important. Mark 9 verse 38: 'John answered Him', Jesus, 'saying, 'Teacher, we saw someone who does not follow us casting out demons in Your name, and we forbade him because he does not follow us'. But Jesus said, 'Do not forbid him, for no one who works a miracle in My name can soon afterward speak evil of Me. For he who is not against us is on our side'. What did Jesus say? 'Don't say anything to someone who is working in My name', but the disciples' attitude was: 'Well, he's not with our band! He's not in our group!'. Did that matter to the Lord Jesus? Obviously not. This is a clear statement on sectarianism that He is wanting to invest into His disciples, because it was essential that they know that whoever was not against Him was for Him, and those who were for Him we were to unite with and work with - even if we didn't know them. What does Paul the apostle say about divides and sectarianism in the Body? Well, look at 1 Corinthians chapter 1 - have you given up? I don't hear the rustling! Don't give up on me yet! First Corinthians chapter 1 verse 10 - I say that and some people are using their mobile phones and all! I nearly ticked a few people off, because I thought they were texting people, and they were on the Bible - I was glad I didn't do that! First Corinthians chapter 1 verse 10: 'Now I plead with you, brethren, by the name of our Lord Jesus Christ, that you all speak the same thing, and that there be no divisions among you', I mean that's emphatic, it's clear, 'but that you be perfectly joined together in the same mind and in the same judgment'. Paul is only referring back to what it was like in the Acts of the Apostles - unity. 'For it has been declared to me concerning you, my brethren, by those of Chloe's household, that there are contentions among you. Now I say this, that each of you says, 'I am of Paul', or 'I am of Apollos', or 'I am of Cephas'', that's Peter, 'or 'I am of Christ''. Paul was the forensic mind, the Pharisee of the Pharisees, he had a real hold on Scripture - Peter said some of the things he said were hard to grasp - the high intellects, I'm sure, would have liked Paul, listening to Paul. Then there was Apollos, he was the great orator, he could hold a crowd, fantastic to listen to. Then there was Peter, and he was the man of the people, down to earth, the 5'8" man that the working class fellow could understand, and the common people heard him. Then there was the real exclusive group that said, 'Oh no, we don't follow men, we follow Christ' - but they were so 'holier than thou', that they allowed that attitude to cut themselves off from the rest of the Body, and that was wrong. They were saying: 'Oh, we're the Lord's people' - but they didn't recognise the rest of the Body. Look at what Paul says in verse 13: 'Is Christ divided? Was Paul crucified for you? Or were you baptized in the name of Paul? I thank God that I baptized none of you except Crispus and Gaius, lest anyone should say that I had baptized in my own name'. You see, Paul's fear was that someone would found 'The Church of the Great Apostle Paul', that was his fear - and mind you it nearly happened. What does Jesus say about sectarianism? He says it ought not to be in the Body of Christ. What does Paul say about it? He says it ought not to be there, because Christ is not divided. I'm going to make a strong statement: denominationalism cannot be of God. Hear what I'm saying tonight, and think with me, and open your heart with me - because this is vital, I believe, for our land tonight. When Jesus said: 'I will build My church, and the gates of hell shall not prevail against it'. I know where I am tonight, but did He mean the Presbyterian Church? Did He? Did He mean the Methodists? Did He mean the Baptists? Did He mean the Brethren? We could go on - did He mean the Protestants? Did He mean the Catholics? What did the Lord Jesus Christ mean? Now please don't misunderstand what I'm saying tonight, I'm not saying the Lord has not used denominations, and I'm not saying the Lord hasn't used denominational churches - but it was not because of their denominationalism! You need to hear this, in fact I would say that those God does use exhibit the least denominational spirit. God mightily used the Presbyterians in 1859 and in subsequent revivals, and Nicholson was a great Presbyterian - but it wasn't because he was a Presbyterian that God used him, I hope you know that! It wasn't because he was all out for Presbyterianism that God used him - no, the very thing that marked Nicholson was, 'All for Christ! All one in Jesus'. Every move of God has been the same: denominational boundaries seem to just melt away. Now I'm not talking about false ecumenism that fudges the issue of who God really is, and just all religions together and all professors together - no matter what they believe about God, or no matter what they say the Gospel of Christ is. I'm talking about division that there is in the Body of Christ among those who truly know the Lord Jesus as their Saviour, but they won't have anything to do with one another, or they look down their noses at one another because, 'You don't belong to my group!'. Sectarianism! Party spirit! D.S. Warner said: 'If the doctrine of Christian unity is true, then division and sectarianism are a great and prodigious evil, and therefore ought to be abolished. Who then will lay the axe at the root of this corrupt tree to help cut it down?'. I know this might be a struggle for some of you tonight, but I believe this is from the heart of God - and that's the only reason why I'm bringing it. John Newton who wrote 'Amazing Grace' said: 'If a man is born again, hates sin, and depends upon the Saviour for life and grace, I care not whether he be an Arminian or a Calvinist'. Amen? There wasn't one there! Amen! I don't care what your background is, I really don't. Now unity is not uniformity, it doesn't mean you have to believe what I believe and I've to believe what you believe - it's all about how we disagree. In Acts there was tension among members in chapter 6, there is a dispute over money - has that ever happened in the church? Oh, you're only after a building project - I don't know anything about it, and I don't want to know anything about it - but disputes over money can happen in churches. There was this row happened because they were collecting all this money, as we saw, together in one pool, and there were Greek speaking Jews who felt that they weren't getting the same cut as the Hebrew speaking Jews - and there was a wee bit of a fight went on. We see that there was disagreement among members, and we even turn to chapter 15 and the great apostle Paul and this man Joseph, who was named Barnabas because he was a son of encouragement, they had a fall out over the head of another disciple, John Mark. So there can be disagreement among leaders. So the early church was not perfect, I don't want to give that impression, but I do believe that they did strive - as Romans says - to, as much as depended on them, to 'live peaceably with all men'. They did their best to stay in fellowship with one another - is that what we do? St Augustine said it's about how we disagree: 'In essentials unity, in nonessentials liberty, in all things charity'. Love - the fruit of love is unity. A number of months ago I was at a day conference in Belfast at the King's Hall, and a man called Jim Cymbala, who has written some tremendous books - one of which is 'Fresh Wind, Fresh Fire' - he's the pastor of Brooklyn Tabernacle in America, in New York. He has seen incredible growth in his church, mainly through prayer. He had this day conference in Belfast, and he told a story - many stories, but one of when he started off in ministry. There was an old man of God who met him one day in a restaurant, just to help him out a little and give him a bit of advice. He said: 'Jim, you're going to meet three types of people in your ministry. You're going to meet 'pastor people'' - you know, 'My pastor is the best pastor in the world, and there's nobody like my pastor. Nobody preaches like him, nobody visits like him. You want to come and hear our pastor!'. Then he said: 'You're going to meet 'church people', local church people, or denominational people' - 'There's no church like my local church, or like my movement, my denominational persuasion'. Then he said: 'You'll meet a third person, you'll meet 'Kingdom people', people who are passionate for the Kingdom of God, for the Body of Christ'. Wherever you hang your hat, or if you don't have one to hang for that matter, you're passionate for God's people, for the whole unified Body of Christ - and you love them! What person are you? I know you've got a good pastor, and I'm not saying anything against your church - but I believe the Lord Jesus needs Kingdom people. Remember that old Psalm, Psalm 133: 'Behold, how good and how pleasant it is for brethren to dwell together in unity! For there the LORD commanded the blessing; Life forevermore'. When God acts, a natural outflow of His life, when He does His work His way, there is unity in the Body of Christ - and divides fall away! I'm not suggesting that everything changes as we've always known it, but these divisions among us become less important until they almost disappear - and I believe that's what God really wants. They're all going to fall away eventually anyway, as the old man said: 'Those of us who go up, the labels will fall off; and those who go down, they will burn off'. There will be no labels in heaven. We might be singing psalms, I'll give you that! But there will be no divisions. While we're fighting among ourselves, the devil is laughing! Where have we come to? Let's be honest! In the light of this primitive Christianity, authentic Christian expression in Acts, and believing that this is a blueprint for how it's meant to be today - where are we? Where are we with one another? Before Andrew Jackson became the President of the United States, he was a general in the Tennessee militia. During the war of 1812 his troops were fighting and bickering among themselves, so he called them together and said: 'Gentlemen, let's remember: the enemy is over there!'. We have a spiritual war to fight in, we're not wrestling with flesh and blood, we're not competing with the other church down the road, or the other denomination, or the other organisation! We're wrestling with principalities and powers, and spiritual wickedness in heavenly places - and while we're fighting among ourselves, the devil is laughing! Turn with me quickly to Joshua 5, boy this came to me recently - Joshua 5 - I can't remember how it came, but it came, and I was impressed by this. You remember that the children of Israel are conquering the Promised Land, and they're coming up to Jericho - this great city - it's going to be hard to overcome. It says in verse 13 of Joshua 5: 'And it came to pass, when Joshua was by Jericho, that he lifted his eyes and looked, and behold, a Man stood opposite him with His sword drawn in His hand. And Joshua went to Him and said to Him, 'Are You for us or for our adversaries?'. So He said, 'No, but as Commander of the army of the LORD I have now come'. And Joshua fell on his face to the earth and worshiped, and said to Him, 'What does my Lord say to His servant?'. Then the Commander of the Lord's army said to Joshua, 'Take your sandal off your foot, for the place where you stand is holy'. And Joshua did so'. Joshua saw this Man with a drawn sword - now I believe it was a pre-incarnate revelation of the Lord Jesus Christ Himself, I believe that - here he sees Him, and he's thinking: 'This guy, He looks pretty tough, is He on our side or is He on their side?'. He asks the question: 'Whose side are You on?' - and it was the wrong question! That's the wrong question! We should not be asking: 'Whose side is the Lord on? ', but 'Who is on the Lord's side?'. The answer of the Lord to this question was just 'No! I'm not on anybody's side, I don't take sides. You must be on my side'. Here's a very deep question to you as an individual Christian, and to the church at large: are we following what the Lord is doing? As Jonathan Edwards says: 'Look for what the Redeemer is doing, what His work is, and get behind it' - or are we asking the Lord to bless our wee agenda, and what we're doing in our plans and our ideas? The church in Acts never did that, you see they waited on the Lord to see what His will was, and then they got behind what He was doing. There were two quarrelling sons in a family - and anybody that has boys will know what this is like - 'It's him! ', 'No! It's his fault! ', 'No! It's his fault!'. The father said: 'Look, you're two brothers, and you've only one father, and I'm not here to take sides, I am here to take over'. That's what the Captain of the Army of the Hosts of the Lord was saying to Joshua that day, and that's what He's saying to the church in Ireland: 'I'm not here to take sides, I'm here to take over! Get out of the way! You follow Me, I'm not on your side, you need to be on My side. You need to get behind what I'm doing, My agenda!'. You see, it's the Father's job to maintain peace in the family, isn't it, and to bring stability to the family? And we as children are fighting among ourselves. This love that we are meant to have for one another manifests itself in the fruit of unity, and it is immensely and intensely practical. Don Francisco wrote a song years ago that said: 'Love is not a feeling, it's an act of your will'. Love is very practical, and I'm not sure emotions never play a part in love, but it is true that we must not adopt the world's concept of love as some ecstatic high that we should never descend from - if that's your idea of love, you'll be sadly disappointed in life and in love. It is a choice to do the right thing, even against some of our inner drives and bents. We see it manifested here: love in unity of purpose, one heart, one soul, one mind. We see it manifested in unity of possessions - as one Body, they didn't say 'That's mine and that's yours', but they considered everything that they owned shared with one another. Many people going to church feel starved, and oftentimes walk out feeling worse than they did when they walked in! But we see also unity in prayer, turn with me to chapter 2 verse 42. It says, verse 41: 'Then those who gladly received his word were baptized; and that day about three thousand souls were added to the church', that's the Day of Pentecost, 'And they continued steadfastly in the apostles' doctrine and fellowship, in the breaking of bread, and in prayers'. Now you would know I have some notions of my own, maybe, but I believe here what the church has done in modern days is carve these four things into four meetings - when, in all likelihood, I think whenever the church got together, they probably got together on a Sunday evening, and they probably did all these things when they came together. I think that's likely, and I'm sure they met up during the week for various things like prayer, and like study, and encouraging one another, and learning and so forth - but what I'm trying to get at is: they, as members, fellowshipped together. That's what fellowship is you know: coming together for the life's Body, to share it with one another - it's not Sunday-go-to-meeting, that's not fellowship. That's why many people going to church feel starved, and oftentimes walk out feeling worse than they did when they walked in! Some think fellowship is tea and buns after the meeting, and having a wee chat - that's not fellowship! Fellowship is sharing the life of the Lord Jesus Christ in the Body! One of the ways it is expressed is in unity in prayer. Now I don't want to stray tonight, but sometimes our prayer meetings are more like preaching meetings - and we are praying in a soul-lish way, that means we're actually praying horizontally toward other people to get at them; rather than vertically to God, ignoring who is around us, not trying to score points - that's not fellowship. Prayer meetings, at times, can be a bit of a talent show, to show how much knowledge I have - some of the best sermons I've ever heard were in prayer meetings! As if the Lord needed to learn something - three points and alliteration - that He didn't know! You know, people giving directions to the Lord in prayer - they're not praying at all. We need unity in our prayer meetings, don't we? We need unity in prayer and the members' fellowship, but the leaders were united as they led. Look at chapter 6, remember there was this bit of a dispute between the Greek speaking Jews and the Hebrew speaking Jews. The apostles, in verse 3, said: 'Brethren, seek out from among you seven men of good reputation, full of the Holy Spirit and wisdom, whom we may appoint over this business', some believe they are like deacons, 'but we', the apostles, 'will give ourselves continually to prayer and to the ministry of the word' - they were united together in understanding what the mind of God was, the word, and praying and worshipping the Lord! That's how the church moved in their leadership! We see that it is how the church faced crises, they were united together in prayer. Look at chapter 12 - you remember James lost his head, Herod the King beheaded him, and then he saw that that pleased the people and he threw Peter into prison. What did the church do to react to this crisis? Verse 5: 'Peter was therefore kept in prison, but constant prayer was offered to God for him by the church'. We see what happened, there was a great miracle, and angels came and released Peter from prison - and he ends up, it's quite comical, knocking on the door at the prayer meeting and they don't even believe that it's him! But when they faced a crisis, what did they do? They went to prayer, they united together in prayer. It's how the church made decisions and moved into the future. Turn to chapter 13, the next chapter - I think, if ever there was a blueprint for how the early church operated, it's Acts chapter 13. Look at verse 1: 'Now in the church that was at Antioch there were certain prophets and teachers', Body ministry, 'Barnabas, Simeon who was called Niger, Lucius of Cyrene, Manaen who had been brought up with Herod the tetrarch, and Saul. And they ministered to the Lord and fasted'. You see, that's the way the early church made decisions: they sought the Lord. They didn't have a committee meeting, they didn't get some of the folk together who were professional men and had good jobs together, and have a few brain cells to knock between one another, and ask them for their nouse - no, that's not what they did! They put their faces on the floor prostrate before God, and they said: 'What do You want, Lord? What is Your will Lord?'. That is what priestly ministry is about - we believe in the priesthood of all believers, that we've all got a role before God to come and ask Him, there's no go-between now only the Lord Jesus Christ, our Great High Priest, and we come to Him - but specifically the leaders of the church, they come, and they wait upon God, and they fast. Oh, it's handy if you believe that's something that used to be done, and you don't need to do it now - that's handy, isn't it? You can just eat your lunch and your fish supper, and not feel guilty about it - but there is fasting in the Bible. It shows desire, it shows how much we want God, it shows how concerned we are for His will. When was the last time you heard of a group of leaders - maybe you've done it here - and when decisions had to be made, and you didn't know what to do, you weren't resting on human wisdom but you really wanted to know the will and the way of God, and you got together and said: 'We're going to pray, and we're going to fast, and we're going to seek God's face. Whatever He says to us we will do it, but we're going to wait on Him'? The Lord spoke, and the Lord says in verse 2: 'They ministered to the Lord and fasted, the Holy Spirit said, 'Now separate to Me Barnabas and Saul for the work to which I have called them'. Then, having fasted and prayed', again!, 'and laid hands on them, they sent them away. So, being sent out by the Holy Spirit' - they weren't sent out by a board, or a denominational body, they were sent out by the Holy Spirit! When God acts, and when He does His work His way, there will be unity in the Body, unity of purpose, unity of possessions - there will be nobody in need. 'If you see your brother in need and are not moved', John says, 'how dwells the love of God in you?'. There will be unity in prayer. I think really what I'm saying to you tonight is: what we see in the book of Acts is not established Christendom as this world knows it. I believe the Body of Christ is within established Christendom, but it's hardly recognisable to what we see here in the original plan. What we see in Acts is not organised religion, it is an organism of life! It is the very life of Christ! I would say to you tonight: don't look for the church institutionally, look for the church relationally, look for the church as it relates to God as Heavenly Father, but look to the church as it relates to one another as brothers and sisters in Christ sharing this life of the risen Lord Jesus - our relationship with God and our relationship with people. That's the church! That's what the church was at the beginning, and that's what God - I believe - wants to restore. I believe the Lord wants a new Reformation in His church today! Wayne Jacobsen says: 'No church model will produce God's life in you' - you can buy all the paperbacks you like in Christian bookshops about how to put bums on the pews, and increase your numbers to tens of thousands, mega-churches. You can do all you like, and I've been to some of them, and I tell you: it's not revival. 'No church model will produce God's life in you, it works the other way around' - remember this - 'our life in God, shared together, expresses itself as the church'. I don't believe you ever decide: 'Right, we're going to do church' - I don't believe that! I believe what you do is you get in relationship with God, and enjoy that life, and enjoy that life together, and church just happens! He goes on to say: 'It is the overflow of His life in us. You can tinker with church principles forever, and still miss out on what it means to live deeply in the Father's love and know how to share it with others'. Do you know a basic definition of the church? It's God's people learning to share His life together. Is that what church does? Sharing the life of Christ together? Oh, that instead of trying to build a church (and I don't mean a building, I'm talking about the organisation), instead of trying to build a church, we would learn just to love one another, and share each other's journey and burden together - and, I tell you, church would happen in a way that we've not seen in centuries. When you talk about church in our land, what do people think about often? Meetings, the background I had, you know: 'You need to go to the meetings, you need to go to the meetings, the meetings, the meetings, the meetings'. If you need meetings to keep you close to the Lord - and I'm not against them - but if you need to be running seven nights a week to keep close to the Lord, there's something wrong, there's something wrong! That's not the life of God. Some of the early Christians were slaves, they weren't allowed to go to meetings. Oh, we need to come together, we need not to forsake the gathering of ourselves together, but we need to stop thinking of church as meetings, and start to think of it as family! Listen to what Paul says in Ephesians 3: 'For this reason I bow my knees to the Father of our Lord Jesus Christ, from whom the whole family in heaven and earth is named' - we're a Family, we are a Body. I don't know what your creed is, or if you even say them or not, but I can say this one: I believe in the communion of the saints. Do you? Ach, you can believe in it all right, but that love for one another is to be manifest in unity. When God does His work His way, there is unity in the Body. Let us pray. Now I want to just take time here - there are so many levels that this ministry can be applied on. There is a national level - and this might shock some of you, what I'm going to say, but I need to say it: I believe there is a day coming, at least God wants, the Lord Jesus' heart wants the time to come, when the labels even of Protestant and Catholic will fall away and there will be one Body in Christ, one Body in Christ. I don't mean the churches coming together in error - that's not what I'm talking about, that's not what I'm talking about - I'm talking about the relevancy of these terms that have, let's face it, lost their meaning, if they ever meant anything. We ought to ask ourselves as 'the Church', are we doing anything to block that, or to get in the way of it? We need to repent, and I know there's a lot of hurt going on all through the years, and a lot of healing needed - but the only Prince of Peace is Jesus Christ. The only 'peace process' that is worth anything is the Gospel. The only answer for our divisions is the Church - not this church, that church, or the other church - the Church of Jesus Christ. That's the only answer. The indictment against us is: we have muddied the waters by our sectarianism and our dividedness. I believe that, and I believe we need to repent. You can pray for revival until the cows come home, but if you don't repent of your part that you have played in communicating hatred, bigotry, sectarianism to the world around - it's hypocrisy. But then there is the local scene: denominations. I see it, and I'll just be honest with you - I hope you appreciate, even if you don't agree, you appreciate my honesty - I see it, and it's just competitiveness at times. Sometimes our doctrine is an idol - that's right! It becomes an idol: 'What I believe'. Then there is the local church, where there can be fighting in the ranks. I know of churches were there are pastors not speaking to one another, actually turning their chairs away from one another in public. How dwells the love of God? Maybe there is somebody in this gathering tonight, and you're not on speaking terms with them - I'm not here to condemn you, but the Lord has spoken to you tonight and you need to sort that out. You may not feel in the wrong, but you need to forgive them. I know your Minister has been preaching a series on forgiveness - maybe there is bitterness in your heart towards somebody here. You know, I know a little bit about revival history, and I know that some revivals broke out around the Lord's Table when one brother got up, and before he would break bread and drink from the cup, he confessed to his brother that he had bitterness in his heart and asked forgiveness - and revival broke out! Boys-a-dear, some circles I know of, if you missed the Lord's Table, it's nearly like the unpardonable sin. Jesus said: 'If you have aught against your brother, leave your gift at the altar and go and make right'. You'd be better not coming to church and sorting out the problems! We have everything wrong - not everything, but we have a lot wrong. Is there someone here tonight who is man enough or woman enough to settle something tonight, to surrender an issue or controversy at the foot of the cross for the sake of the Gospel and the Kingdom of Christ, and the name of the Lord Jesus, and His reputation? This is heavy stuff, I know. You deal with God in the quietness of your heart, whatever the issues are. I want to ask something tonight, before we sing our final hymn: I would like this stillness that there is in the meeting just now to stay in this room. Even the musicians - if you don't mind, I hope I have the liberty to ask this - not to play just after the hymn. Allow this stillness that is the Presence of God, as people are dealing with God in their hearts - serious issues - allow that Presence just to linger and hover. You can fellowship outside and chat, and we want to make room for that, that's important - but we don't want to stifle in anyway what God is doing. Would you do that? This sermon was delivered at Union Road Presbyterian Church in Magherafelt, Northern Ireland, by David Legge. It was transcribed from the fourth recording in his 'When God ACTS!' series, entitled "Unity In The Body" - Transcribed by Andrew Watkins, Preach The Word.